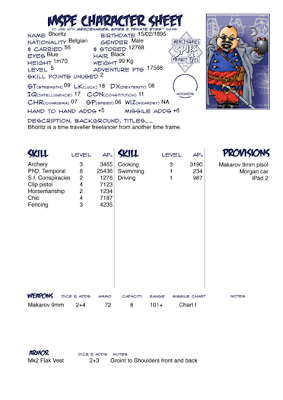 Having witnessed more interest than I had imagined for my two posts about MSPE, here is another play aid, a fillable pdf character sheet. It is a very plain one, but I hope it shall be useful for you. You can download it here. And, of course nothing prevents you from using it with Tunnels & Trolls (I have added the stat Wizardry that I have sometimes used with MSPE). It is, of course, nice to be able to fill a character sheet on screen, if only to avoid crossings out. But what are you going to do with it when it is filled? That's where things get more complicated (thanks Adobe). Opening the PDF file and filling the fields should be no problem. You could just open it with Adobe Acrobat. But, a window above the document shall warn you that you can't save any modifications or fillings you have made on the PDF. You can only print the page. If all you wanted to do with your character sheet was to print it on paper, fine. But if you wanted to keep a filled document on your hardrive, there is one more step. If you are on a Mac, no problem, the OS let you print in PDF from any application. Nice. If you opened the PDF form with Preview or Acrobat Reader, you just have to choose "Print" "Save as PDF" and you'll have a document with filled fields. Those fields won't be editable anymore. If you are on a Windows OS, you'll have to setup an application to print to PDF (which just means save your file in a non editable PDF). A program like PDFcreator (free) should work though there are others, free or not. If you are on Mac, well, Preview let you also fill your PDF form and keep it in an editable format. Instead of choosing to print to PDF, you just have to save your document, that's all. But, if you want still more functiunalities, there is PDFsigner, which can not only save an editable PDF, but also insert images on it. This way, you can add one or more illustrations, which is quite useful for a character sheet. And the document is still modifiable. The application is available on the Appstore for 9 dollars, which should not bankrupt you. A must for Mac users GMs. If you use a Windows OS, Foxit (free) shall let you save your PDFs and change them later. And, what is most important, Foxit can also import images. From all those options, Foxit is really the best and I can only regret that it doesn't exist on Mac. If you know about alternatives applications, let us know about it. CEO d'une entreprise de consultance en deplacements paratemporels et dessinateur occasionnel.